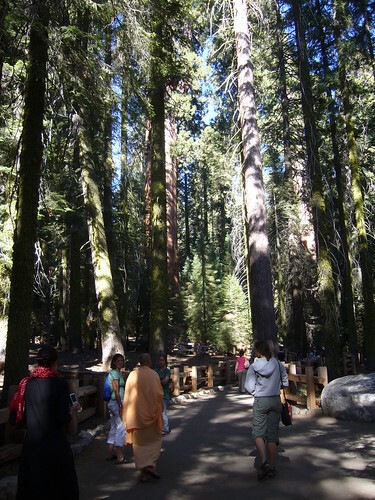 The day after LA Rathayatra we made our way to Sequoia National Park in Kings Canyon, California. Somehow I was under the impression that it was a short drive away, but as we passed through countless small towns and huge expanses of farmland, I realised it might be further away than I thought. I think being English really makes you expect everything to be much closer together. I marvelled at the change of landscape as we drove – the coastal California that we had seen over the past few days – Laguna, LA, San Diego, gave way to dry, mountainous vistas, dotted with forests and sprinkler-fed fruit farms. 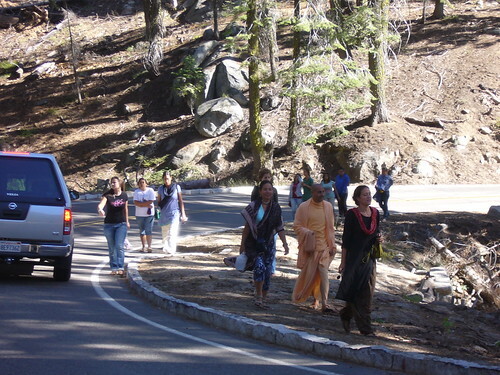 In the front of the bus, people like Premanjana and Jaya Radhe, who used to be a part of the ISKCON community in Three Rivers (just nearby) talked about their childhood memories of the area. Soon the bus was getting overheated, the roads getting smaller and windier, curving past huge boulders and banks covered in red manzanita bushes. The drive seemed to go on forever and we eventually stopped asking how much longer it would be (a lesson you learn after a while on the bus tour). We were too tired to cheer as we rounded the corner into the campsite that we would be staying at. Some of us were even wondering if this was just another routine stop, to let the bus cool down before carrying on our drive. We slowly emerged from the buses, blinking in the sunlight and stretching out aching muscles, breathing in the fresh, clean air of the forest. 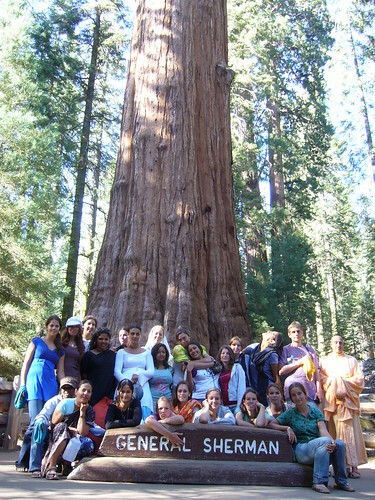 After eating, the girls (plus Radhanath Swami and Manu) piled onto the boys bus to drive to General Sherman, the biggest tree in the world. Another stomach churning drive later, we all got out again and walked up the short path to the tree. 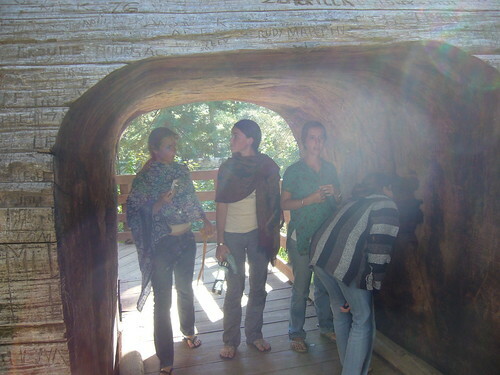 Even before we got there, we passed through a fallen trunk so huge that an arch had been drilled through so people could pass. 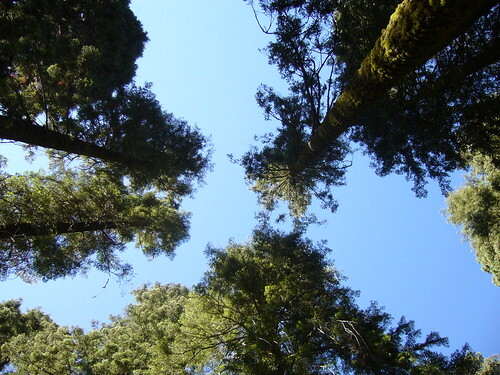 All around us towering sequoias reached to the sky, their red trunks dotted with bright green moss. The information board in front of General Sherman stated that for a human, looking up at the tree was the same perspective as that of an ant, looking up at a 6ft human! Maharaj called us over to a little area near the tree and asked us to meditate on what advice we would give to the world if we were stuck in the body of this 2,700 year old tree, witnessing the rise and fall of empires and the degeneration of the planet. He talked to us about the amazing tolerance of the tree, and how we can follow this example as Vaisnavas – humility and tolerance being some of the foremost qualities. One girl asked how we can be humble and selfless in a situation where we need to be strong and firm, and Maharaj replied that, to show courage is an aspect of humility, but only if the motivation is not selfish, but for Krsna. Jaya Radhe reminded us of the quote – ‘real humility means not to think less of yourself, but to think of yourself less’. As the sun sunk lower in the sky, Maharaj suggested that as the tree had been suffering for so many thousands of years, stuck in a helpless state, we should try to help it on its journey home, by chanting Hare Krsna. So we gathered in front of the tree (much to the surprise of the few remaining tourists) and chanted, first quite softly, then getting louder, our voices rising as we looked up to the furthest point we could see, where the tree rose above the entire forest canopy. As we chanted, I suddenly became very choked up and I found that I could barely say the words. I struggled to chant the Pancatattva mantra, realising how precious it is; how these personalities are our only hope; the shining lifeline out of this sinking world. How long had the soul of this tree waited to hear these divine names? I felt overwhelmed in the same way as I had several years ago at Srivasa Angan in Mayapur, chanting and dancing in the courtyard where Lord Caitanya’s sankirtan movement was born. How long have we waited to be born in these bodies; to receive this precious jewel of transcendental knowledge? We have been plucked from a completely helpless state and given an opportunity of immeasurable value. We are so lucky, yet our position is so tenuous. I know for myself, as a gurukuli, it’s so easy to take a laid back attitude towards Krsna consciousness. After all, there’s been very little struggle to attain this knowledge – so there’s not much motivation to hurry up and act on it. But sometimes I realise. And in realising what I have, I realise how important it is for me to take the responsibility to give it to others. A gift must have a giver, and the more people that give, the more that can receive and change their lives eternally. We ended by chanting the words of Lord Caitanya, from the Siksastakam, praying to this greatest of trees to give us tolerance and humility. Considering oneself to be lower and more worthless than the grass , being more tolerant than a tree, being prideless and offering respects to everyone according to their respective positions, one should continually chant the holy name of Sri Hari. I pray to Sri Krsna Caitanya, Sri Nityananda, Sri Advaita, Sri Gadadhara and Srivas Thakur to be merciful and help me understand how to pass this knowledge on to others; without them, my fragile desire will surely evaporate and my efforts will be useless. So, I’m home after almost three months in America, eight weeks of which I spent living on a bus and waking up in a new place almost every day. It was again a wonderful experience – different this time, but I think that is inevitable experiencing anything for the second time around. Returning home has been strange. My brain seems to adjust very slowly to drastic changes of location and I always experience a dislocating feeling of my mind and body being in two entirely different places at once. As for returning to this blog, I feel quite overwhelmed with the bulging diary sitting on my desk, the several hundred photos I took and the lingering thoughts, ideas and impressions that have remained through the fog of jet lag. I want to share my experiences, but writing about events several weeks later doesn’t have quite the same immediacy or excitement, for me, or I’m sure for anyone else to read. Still, I hope to write about some of the highlights. Over the summer I met some wonderful people that inspired me and taught me lessons that will stay with me forever. I visited so many places – some dull and generic (I lost count of the amount of supermarket car parks I sat in at mealtimes) , and some that are considered some of the most beautiful places on earth. I performed in our bus tour show ‘Devotion’ in 26 halls and temples across North America, and along the way I was inspired so much in my Krishna conciousness. I just put in my last batch of laundry from my trip. I pulled out a skirt right at the bottom and suddenly realised that the last time I had worn it, I was leading a kirtan on the Rathayatra procession in Calgary. Sigh. Summer’s over, but all’s well that ends well. Tune in soon for my diary posts.